After reviewing the JLL T350 Digital Folding Treadmill, I discovered the JLL S300 Digital Folding Treadmill and tried to figure out their differences. They both have almost equally advanced features but this specific model is more affordable, therefore it comes with fewer features. Despite this, the JLS300 Digital Folding Treadmill is still a very functional treadmill and it has satisfied a lot of Amazon customers. No wonder it gained 4 and a half stars! This treadmill offers a large running area that measures 122cm x 40cm and if you’re over 6 feet, it’s good enough for those who are 6 foot 4 inches tall. 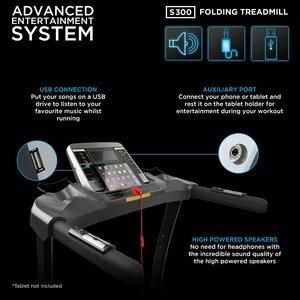 If you prefer to listen to music while working out, the JLS300 Digital Folding Treadmill might be a great choice for you. It has built-in high powered speakers where music can be played by inserting a USB flash drive or connecting your phone or tablet to the AUX port. Additionally, this treadmill will reduce the strain on your joints because it has an advanced cushion deck. Because the JLS300 Digital Folding Treadmill is a completely automatic fitness machine, controlling it with just a push of a button is possible. The levels of incline are smoothly adjusted by the treadmill itself and you can change the speed on the handrails. There are 20 levels of incline and this treadmill has a top speed of 16 KM/H. Therefore, you can constantly challenge yourself until you’re able to reach the fastest speed and the highest level of incline. You can also do this on a wide running area that measures 122cm x 40cm, it’s slightly larger than other treadmills in the same price range. After working out, you can easily store this treadmill because of its soft drop system which means it has a hydraulic arm that assists the machine when folding and unfolding. Getting fit shouldn’t be boring, and that can be achieved with the JLS300 Digital Folding Treadmill. It’s a fitness machine with an advanced entertainment system so you could play some motivating music while focusing on your goal. Aside from being entertained whilst running, this treadmill also offers 15 running programmes that comes with 3 customisable workouts. You can either follow the well-strategised plan that’s integrated with the machine or you can create your own based on your own preference. You can select and view the workout programmes on treadmill’s 5-inch LCD monitor which also displays the time, speed, distance, heart rate, and calories burned. A treadmill is a great fitness machine for anyone because running outside isn’t always convenient especially with the unpredictable weather nowadays. Avoid getting joint pains from uneven surfaces and suddenly shifting directions with the JLS300 Digital Folding Treadmill. It has an advanced cushioning system that reduces the strain you feel on your joints when running. 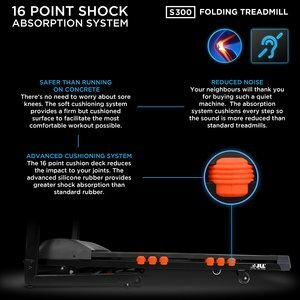 The running deck is integrated with advanced silicone rubber that provides greater shock absorption than the standard rubber that’s used on average treadmills. With a maximum user weight of 120kg and a continuous power of 2.5 HP to a peak power of 4.5 HP, this treadmill seems very durable for the whole family to use. Additionally, it has a heart rate sensor built into the handrails to make sure you’re in good condition before, during and after running. 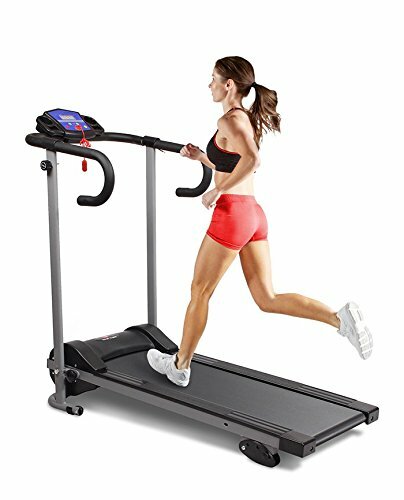 If you’re looking for a more affordable treadmill to start with, this treadmill can be included in your choices. However, since it’s in a low to mid-range price, expect that the features are fewer compared to the JLL. 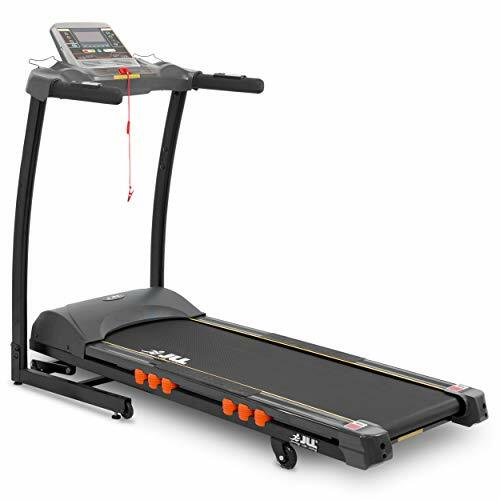 This one is a compact treadmill that has a smaller running area that only measures 101cm x 34cm while the JLL S300 Digital Folding Treadmill as mentioned measures 123cm x 41cm. It has 3 built-in programmes with a top speed of 10KM/H. This treadmill also has 3 levels of incline which are manually adjusted. In addition, the Hi-Performance New Motorised Electric Treadmill has a 1.0 HP motor which is impressive when compared with other treadmills within its price range. It has wide handlebars with speed buttons, a large LED display, and it has an emergency stop cord that automatically stops the machine in case you fall. Although this treadmill isn’t integrated with a lot of advanced technology features, it still does serve its purpose of being a fitness machine. If you’re not really particular about automated fitness machines, you should definitely consider this one. Reebok is a very popular brand that manufactures apparel, footwear and fitness equipment. It’s no wonder this treadmill gained a lot of positive reviews and it has earned 4 stars on Amazon. If you want an even wider running space than the JLL S300 Digital Folding Treadmill, this one measures 126cm x 41cm and even still saves space when not in use because it’s foldable. 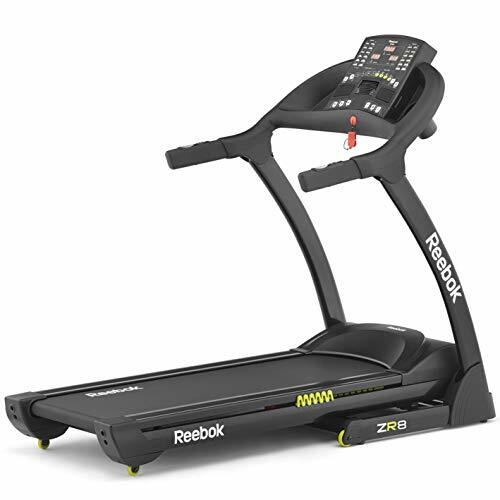 This treadmill also helps you run in comfort with its own ZigTech cushioning technology that absorbs the shockwaves we produce when running, which can cause strain on the joints. Therefore, it also reduces the pressure between the soles and the machine which in effect, makes running more enjoyable than ever. This treadmill has a 2.0 HP continues duty motor, a speed range of 1-16 KM/H and 15 levels of incline. It also has built-in speakers with an MP3 input and it has volume controls to pump up your training. The maximum user weight of this treadmill is 120kg and it has a top speed of 16KM/H. This affordable yet impressive treadmill is something to consider if you’re on a tight budget. 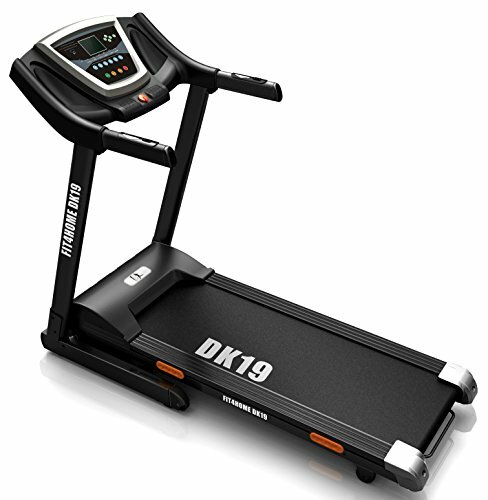 The Olympic 2000 DK-1 Manual Incline Treadmill has a 1.75 HP motor which can pass as a good treadmill. However, it’s a lot less compared to the JLS300 Digital Folding Treadmill that has a continuous power of 2.5 HP to a peak power of 4.5 HP. However, there are still other features included in this simple treadmill that make it reasonable for its price. It has onboard speakers where you can play music through the AUX and USB input. It has a maximum user weight of 110 KG and a top speed of 14 KM/H. It’s also easy to store since it’s foldable with a hydraulic-assist and built-in transportation wheels. In addition, maintaining this treadmill wouldn’t be a problem because it’s auto-lubricating and the belts can be easily adjusted. The rubber material on the running deck is also anti-static and noise-reducing so you won’t have to worry about any of these factors. 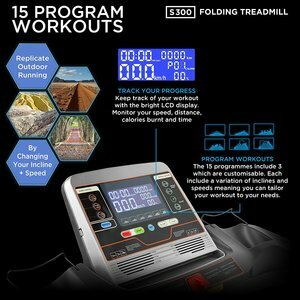 Although there are a lot of treadmills on the market that are more affordable than the JLS300 Digital Folding Treadmill, you should always look into what will work best for you. You should always feel excited to workout and I think this treadmill is just the fitness machine to keep you going. It has a comfortable and wide running deck, an advanced entertainment system, it’s easy to operate and easy to store. On top of that, it has a wide speed range to constantly add challenge to your workout as you get used to running.